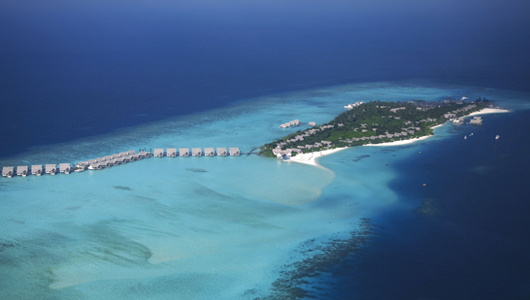 Welcome to Four Seasons Resort Maldives at Landaa Giraavaru. 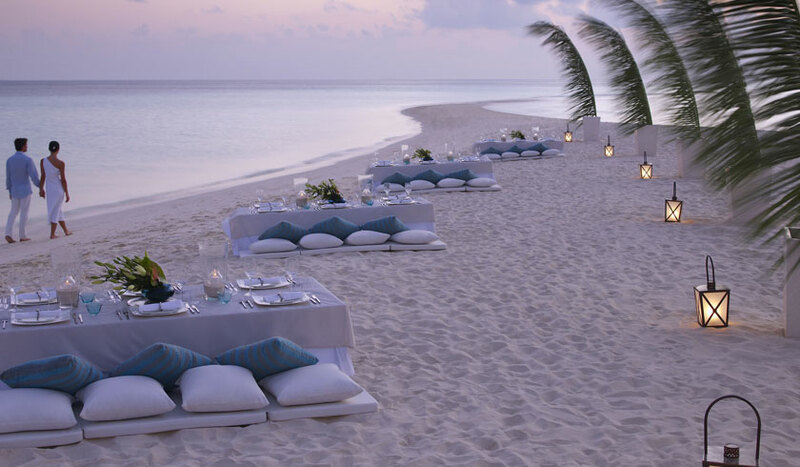 Fringed by the Maldives’ most spectacular lagoon and a long, deep swath of white coral sand, Four Seasons Resort Maldives at Landaa Giraavaru embraces both land and sea, lush gardens and the timeless blue of the Indian Ocean. Experience an idyllic retreat and sophisticated pleasures on a coral atoll all its own, just a short, scenic flight by seaplane from Malé. 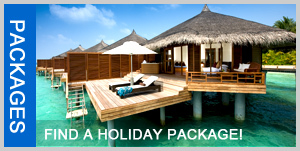 Beach Bungalows with Plunge Pool feature a spacious, foliage-filled garden overlooking the pristine beach and lagoon. With separate living and sleeping pavilions, they provide maximum privacy in a rustic setting. The 91-square-metre (980-square-foot) garden features a private plunge pool. An open-air bale (traditional thatched hut) serves as the living and dining area. It features comfortable sofas and a daybed and is equipped with high-speed Internet access. The sleeping pavilion is air conditioned. 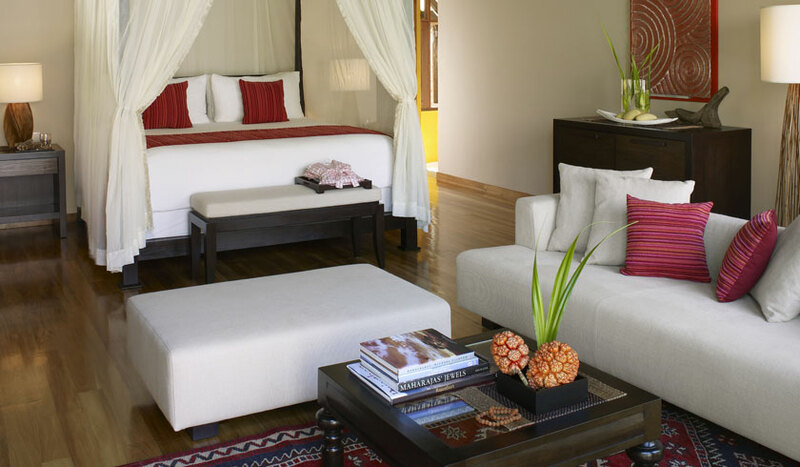 It features teak wood furniture, including a four-poster king bed or twin beds with mosquito nets. Additional amenities include a plasma screen television, audiovisual system with DVD player, coffee- and tea-making facilities and private bar. The large full bathroom has a deep soaking tub, double vanity and separate family-size indoor rain shower that opens onto an outdoor walled area featuring a traditional Maldivian shower. Located along a double-loaded jetty off the northwestern end of the island, these villas are perfectly positioned for viewing sunrise or sunset. Water Villas with Plunge Pool feature a 53-square-metre (570-square-foot) deck overlooking the pool, with access by spiral staircase to a furnished sea-gazing loft. The living/dining area is glass-fronted and features comfortable sofas. A bedroom, adjacent to the living room, is also glass-fronted, creating a double-width glass façade for taking in the views. This spacious room is air conditioned and features teak furniture, including a four-poster king bed or twin beds with mosquito netting. Additional amenities include a plasma screen television, audiovisual system with DVD player, coffee- and tea-making facilities, private bar and separate dressing area. The large full bathroom has a deep soaking tub, double vanity and separate family-size indoor rain shower that opens onto an outdoor walled area featuring a traditional Maldivian shower. An additional outdoor shower is located on the deck for use after a quick dip in the lagoon. Located along a double-loaded jetty off the northwestern end of the island, Water Villas are perfectly positioned for viewing sunrise or sunset from an elevated loft. Water Villas feature a 53-square-metre (570-square-foot) deck with access by spiral staircase to the furnished sea-gazing loft. A bedroom, adjacent to the living room, is also glass-fronted, creating a double-width glass façade for taking in the spectacular views. This spacious room is air conditioned and features teak furniture, including a four-poster king bed or twin beds with mosquito netting. Additional amenities include a plasma screen television, audiovisual system with DVD player, coffee- and tea-making facilities, private bar and separate dressing area. 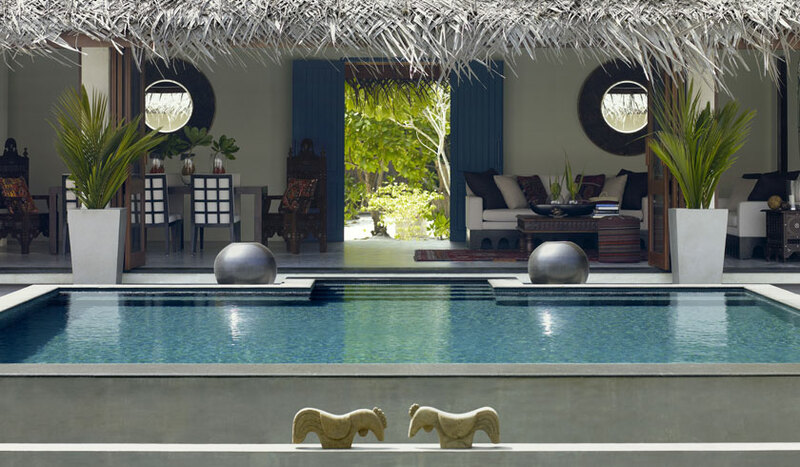 The 260-square-metre (2,799-square-foot) outdoor area features a 12-metre (40-foot) lap pool surrounded by a deck with daybeds and a traditional Maldivian swing. The living/dining pavilion is a sand-floor open-air pavilion with comfortable sofas and an over-sized daybed on the loft level for ocean viewing. The sleeping pavilion is air conditioned and features teak furniture, including a four-poster king bed or twin beds with mosquito netting. Additional amenities include a plasma screen television, audiovisual system with DVD player, coffee- and tea-making facilities, private bar and separate dressing area. 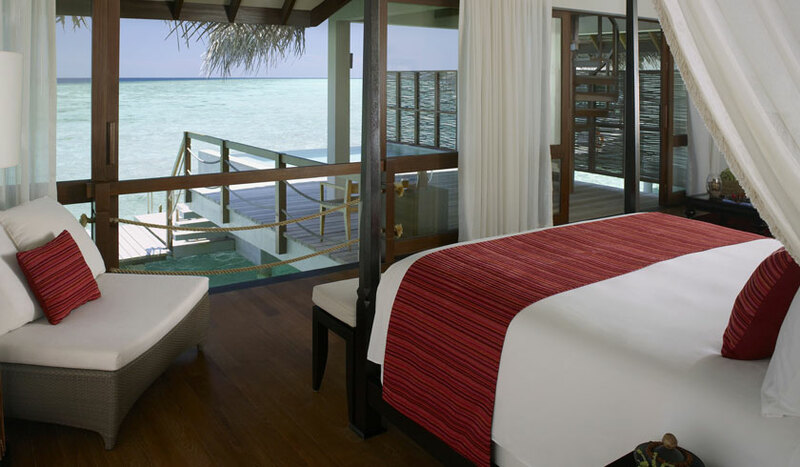 These two-bedroom villas are located at the northwestern corner of the island, at the end of the Water Villa jetty. They command stunning views of both sunset and sunrise. A spacious deck features plunge pool and direct access to the beach and lagoon. The 890-square-metre (9,580-square-foot) outdoor area features a deck with sun lounges, a dining table that seats six and access to a sea-gazing loft with two over-sized daybeds. Steps from the deck lead to a 15-metre (50-foot) plunge pool and a platform with outdoor shower, leading to the lagoon. The living and dining area, overlooking the plunge pool and deck, features comfortable lounges and sofas, a plasma screen television, audiovisual system with DVD player, dual-line telephone, high-speed Internet access, private bar, coffee- and tea-making facilities and an espresso machine. The dining area seats six. Each air-conditioned bedroom has a sitting area and closet. 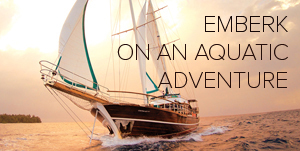 Additional amenities include a plasma screen television, audiovisual system with DVD player and dual-line telephone. The spacious full bathrooms each have a deep soaking tub, double vanity and separate family-size indoor rain shower that opens onto an outdoor walled area featuring a traditional Maldivian shower. Nestled in the vast 890-square-metre (9,580-square-foot) outdoor space is a 30-metre (98-foot) lap pool with an island dining room “floating” over the 10-metre (33-foot) reflecting pool section near the east end. Nearby, a beach-side bale (traditional thatched hut) provides shade where you can enjoy the hypnotising ocean breeze. A large, open living/dining pavilion features comfortable lounges and sofas, direct access to an outdoor courtyard and a furnished veranda. Indoors, a dining area seats eight. Adjacent to the dining area is a full kitchen complete with refrigerator, microwave oven, toaster, juicer and espresso machine. A full bathroom and maid’s room are located off the living area. The air-conditioned master and guest pavilions feature bedrooms with a sitting area and oversized closet. Additional amenities include a plasma screen television, audiovisual system with DVD player, private bar, coffee- and tea-making facilities, writing desk and high-speed Internet access. The garden courtyard is furnished with two massage beds; the veranda has two sun lounges. Uniquely designed Koimala Land and Ocean Villas are built over land and water on the western shore of the island. A land pavilion houses the living area, while the sleeping pavilion, steps away, “floats” on water. The two two-bedroom villas can be combined to make one four-bedroom land and sea estate. The foliage-filled 400-square-metre (4,306-square-foot) outdoor garden features an 11-metre (36-foot) pool with built-in seating, a sundeck, a bale (traditional thatched hut) and sun lounges. Private beach access to the lagoon is available from a platform with outdoor shower. The land pavilion features al fresco living and dining areas, a library that can also be used as a guest room, a dining area that seats six, a full kitchen and a maid’s bedroom. Amenities in the living and dining areas include comfortable sofas and lounges, a plasma screen television, audiovisual system with DVD player, private bar, writing desk, dual-line telephone and high-speed Internet access. The full kitchen features a refrigerator, stove, microwave oven, toaster, juicer, espresso machine and a full range of cooking utensils and crockery. From the living pavilion, a teak veranda leads to the sleeping pavilion, which is built on stilts over the water and features two air-conditioned bedrooms, each with a separate dressing area. From a spacious deck outside the sleeping area, a sea-gazing open-air pavilion provides stunning views of the lagoon and ocean beyond. Steps lead to a lower platform for direct access to the beach. 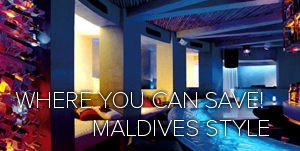 Three spacious full bathrooms each feature a deep soaking tub, double vanity and separate family-size indoor rain shower that opens onto an outdoor walled area with a traditional Maldivian shower. A guest powder room is located in the living pavilion. An additional outdoor shower is located on the deck for use after a quick dip in the lagoon. 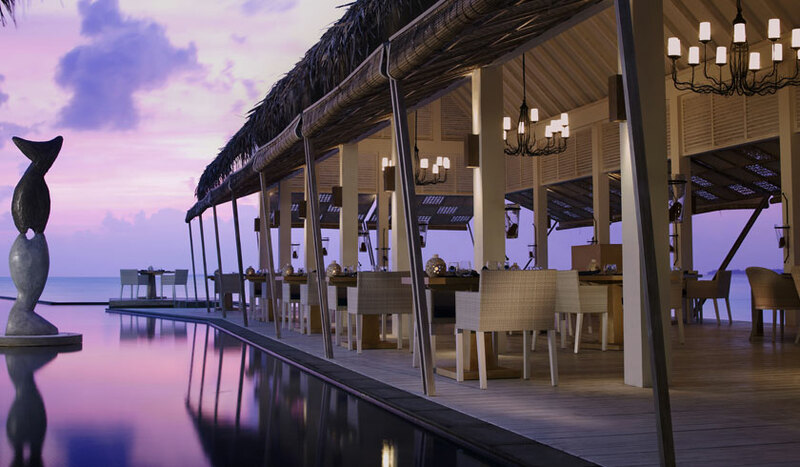 Overlooking the swimming pool and beach, the three thatch-roofed pavilions of Café Landaa appear to float above the sapphire waters on the north shore of Landaa Giraavaru. For breakfast, lunch and dinner, our chefs create exquisite delights with eastern and western influences. The restaurant seats 82 indoors, 8 at the sushi counter, 8 at the teppanyaki counter and 50 outdoors. The Landaa Spa is a resort in itself, providing a comprehensive approach to physical, spiritual and mental well-being, with a special emphasis on yoga and ayurveda. Secluded open-air treatment areas make the lush tropical setting an integral part of the relaxation and treatment process.